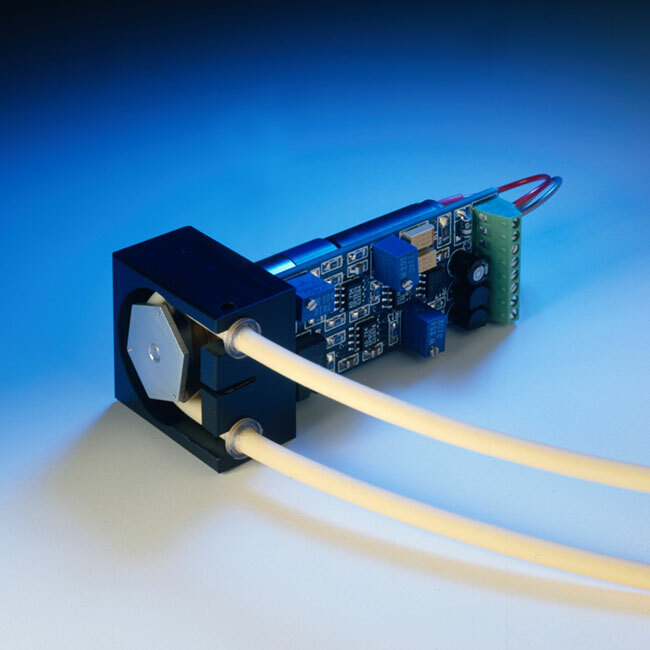 P625 peristaltic pumps are ideal for fluid transfer applications where size, power efficiency, and precision are important. The pump head and analog electronics are designed for integration into a larger system. Flow rates from 0.0007 to 19 ml/min. Configure the pump with one of four Swiss-made motor and gearhead assemblies to best match your low-flow application. The specially contoured pump head minimizes pulsations and improves accuracy. Precise bi-directional speed control. Built-in circuitry provides linear flow rate control over a 10:1 range, requiring only a single supply and an analog control voltage. Low power, low noise operation. Typically drawing between 25 and 75 mA, this pump is well-suited for battery powered applications. An all-analog design minimizes EMI. Easy-to-use tube sets. Tube sets can be installed and removed in seconds. They are available in a range of sizes and materials and all but the largest tubing sizes are available with two channels. Choose pump roller size based on tube set material (see brochure download below for details). [material] = S (silicone), C (C-Flex®), P (PharMed®), T (Tygon® F-4040A), L (Tygon® LFL), V (Viton®). 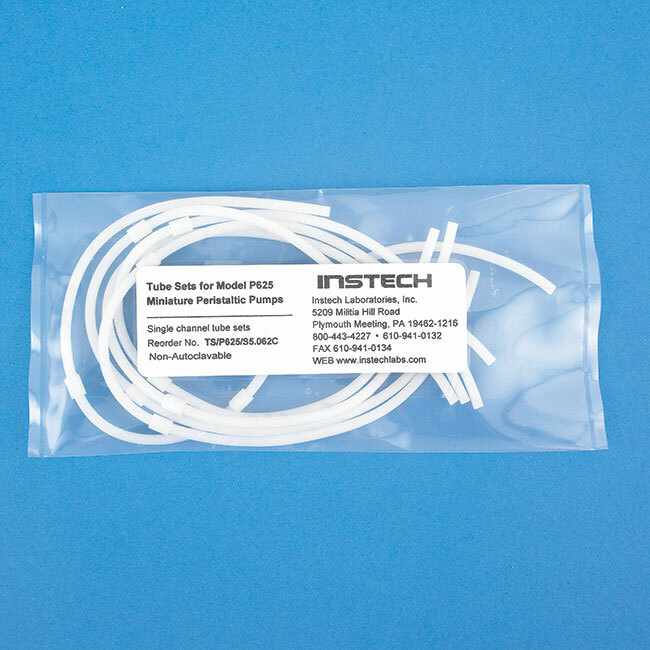 For example: P625/TS031S specifies a single channel silicone tube set with 0.031" ID. The standard length is one foot (30.5 cm). Custom P625 tube sets may be available, depending on your application. P625 pump tube sets are not autoclavable, though tube sets may be special ordered with EtO sterilization. P625 pump tube wall thicknesses are always 1/32in (.031in/0.8mm), so the OD will always be .062in larger than the ID. For materials other than silicone, sizes are limited. Higher durometer tubing sets require pumps with smaller OD rotors. Please download the PDF below for complete information. Tube sets are sold in packages of five, as shown.